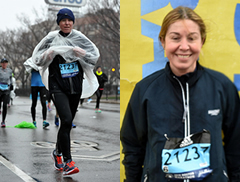 Diagnostic Testing Coordinator, Micaela Piazza has run 19 Boston Marathons as of April, 2019. She has also run marathons in Lowell, Massachusetts, Portland, Maine , New York, Disney World in Florida, Albuquerque, New Mexico, Rhode island, Connecticut. She ran first marathon at age 29. The driving rain and wind in 2018 affected a little of her time but did not leave her depleted, it was just cold waiting to start. That was the worst part of it all. Micaela was back to work and running the next day. Office staff members schedule patient appointments, diagnostic studies and respond to disability insurance form requests and patient requests for medical records and x-rays. Surgical Coordinator schedules surgery, pre-op testing, consults, blood donations and responds to all surgery related questions. ©Copyright 2017 Boston Foot and Ankle | Boston Podiatry | Boston Podiatrist. All rights reserved.